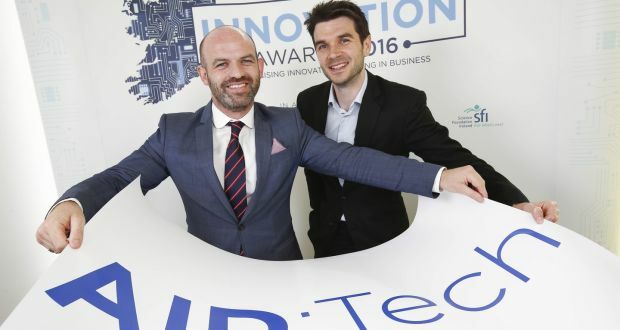 Joseph Thompson AID:Tech chief executive and Niall Dennehy chief digital officer and co-founder of Aid:Tech, finalists in the fintech category of the Irish Times Innovation Awards 2016. Photograph: Conor McCabe. In late 2015, hundreds of Syrian refugees at a camp in Lebanon unwittingly became the first to use blockchain technology as a means of receiving humanitarian aid. Blockchain will soon become as familiar a concept as the internet, but right now its potential is the stuff of backroom ideas and development among start-ups and high finance. Where it exists in use, it is nascent and unfamiliar. “We just became obsessed with the technology and we found a way to harness it that nobody else did,” explains Niall Dennehy, chief operations officer at Aid:Tech, where blockchain intersects with humanitarianism. Dennehy and his colleagues – chief executive Joseph Thompson and chief technology officer Kieron Farrelly – were inspired by Peter Diamandis, the entrepreneur and chairman of the Xprize Foundation who has said unless people are trying to solve humanity’s biggest problems, they are doing it a disservice. Already gripped by blockchain, Dennehy said they asked themselves three questions: what will make a difference; what is sustainable; what is interesting? The answer was improving supply chain management. Blockchain is, at its simplest, a digital spreadsheet of transactions – easy to share, impossible to destroy – enabling safe, transparent accountability. Its use in the aid sector, where fraud, theft and general mismanagement all occur, appears a no-brainer. Last December, Aid:Tech set out to see it in action. In a pilot programme it provided 500 digital “credit cards” to Syrian refugees, each with $20 (€18) for use in a camp store. “The beauty of it was that it’s all on blockchain and they could monitor that in real time and see all the transactions online,” said Dennehy. A traditional paper voucher system was simultaneously in place. These are problematic because fraudulent copies inevitably emerge. Within a matter of hours, the same thing was attempted with the Aid:Tech cards – perfect copies were being presented to the shopkeeper but were useless once the QR code was scanned and showed the attempted transaction to be invalid. “We really have a highly scalable technology that can be rolled out across the world,” said Dennehy, using this story as an exemplar of the security of digital currency and its traceability. The applications for large scale aid programmes appear obvious. Enormous amounts of money circulate among charities, NGOs and other humanitarian organisations. It is transformed into goods and services and there is significant benefit in reliably accounting for all of it. This is the expansive market Aid:Tech is targeting. Official Development Assistance (ODA) at the Organisation for Economic Corporation and Development (OECD) amounted to €131.6 billion in 2015. In the UK alone, there are more than 195,000 charities raising close to £80 billion (€94bn) annually. Aid:Tech says these areas lack degrees of transparency. And it’s not just the charity and humanitarian sectors. Aid:Tech has identified a need for similar structures in other areas where large volumes of capital are in circulation, notably in the distribution of social welfare payments. The company has already been exploring various options with governments inAfrica and the EU, a measure of its belief the future has a foot in both the developing and developed worlds. Further down the line, there is the added potential to produce and accumulate valuable data on delivery systems, measuring effectiveness and illustrating the value of transparency. Recently in Dublin, Aid:Tech spoke to a “big corporate” that hinted at an increased interest from companies in donating to charities to fulfil social responsibility remits where they could easily monitor the actual use of their money. If blockchain is the future of transactions, Aid:Tech is championing the cause of alternative applications outside of high finance. The for-profit has attracted attention. Economist Constantin Gurdgiev, a professor of finance at Trinity College Dublin and Middlebury Institute of International Studies, Monterey, has become an advisor and investor. It has captured the attention of others too. Aid:Tech has been selected as one of 11 “Techstar” companies in London, a mentoring programme seeking the world’s most innovative companies and has reached the final 30 in the European Commission’s “European Social Innovation Awards” from 1,095 entrants.